We. 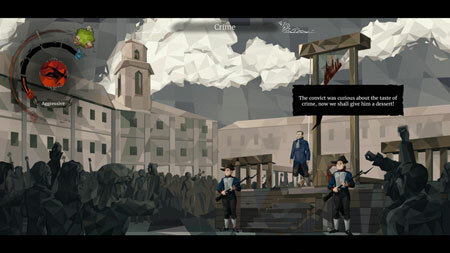 The Revolution is a unique historical strategy game developed by Polyslash. As a judge of the Revolutionary Tribunal, preside over complicated cases of ordinary citizens, dangerous criminals, and enemies of the revolution in revolutionary Paris. Make judgments, plot political intrigue, and try to not lose your own head. The power over human life and death is a heavy burden, responsibility and strength that can affect the fate of the revolution. keep that in mind each time when passing sentence in the courtroom, while assigning tasks to your agents, giving speeches, and weaving political intrigue behind the scenes. Addressed chiefly to players who enjoy to settle moral dilemmas, make complex personal choices, and immerse themselves in the world of sophisticated political intrigue. Shape history and decide who will live and who will die. Experience the oppressive atmosphere of the French Revolution as you know it from classic novels of Alexandre Dumas and Joseph Conrad. Preside dozen of unique and morally ambiguous court cases. If you get stuck in the game, check out the video walkthrough and gameplay for the game. This entry was posted in PC Games, Walkthrough and tagged We. The Revolution Cheats, We. The Revolution Gameplay, We. The Revolution Guide, We. The Revolution Strategy, We. The Revolution Walkthrough by Marvin. Bookmark the permalink.